Canadian companies may be suffering sales delays due to customer privacy concerns of up to five weeks, if a Cisco Systems study is accurate. That’s measurably longer than many respondents in 17 other countries said they see sales delays due to privacy worries, with the average of 3.9 weeks. For example, in the U.S. survey respondents said they see delays of 3.7 weeks, in Australia 3.9 weeks, in the U.K. 4.9 weeks. Italy and Turkey tied with the least at 2.2 weeks. The data is part of Cisco’s recently released Data Privacy Benchmark study, Overall, 87 per cent of the 2,081 respondents said they do have privacy-related sales delays, whether from existing customers or prospects. “This is significantly higher than the 66 per cent of respondents who reported sales delays in last year’s survey and is likely due to the increased awareness of the importance of data privacy, GDPR (the European Union’s General Data Protection Regulation) becoming enforceable, and the emergence of other privacy laws and requirements,” the report argues. Respondents said the main reasons for any privacy-related sales delays at their organizations included the need to investigate specific customer requests, translating privacy information into the customer’s language, educating the customer about the company’s privacy practices or processes, or having to redesign the product to meet the customer’s privacy requirements. So, do increasingly tough privacy regulations like the GDPR get in the way of the bottom line? No, says the report. “The findings from this study provide strong evidence that organizations are benefitting from their privacy investments beyond compliance. 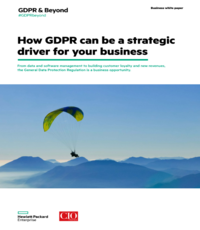 Organizations that are ready for GDPR are experiencing shorter delays in their sales cycle related to customers’ data privacy concerns than those that are not ready for GDPR. GDPR-ready organizations have also experienced fewer data breaches, and when breaches have occurred, fewer records were impacted, and system downtime was shorter. As a result, the total cost of data breaches was less than what organizations not ready for GDPR experienced. The study used data from Cisco’s annual Cybersecurity Benchmark Study, a double-blind survey of more than 3,200 security professionals in 18 countries. Many of the privacy specific questions were addressed to more than 2,900 respondents. Of the Canadian respondents, 60 per cent said their firm was GDPR-ready at the time of the survey, which was average for the group. However, Cisco says the numbers suggest organizations which reported they are meeting all or most of GDPR’s requirements had an average sales delay of 3.4 weeks, compared to 4.5 weeks for organizations which aren’t yet ready but expect to be within a year, and 5.4 weeks for those organizations that are over a year away from being GDPR ready. Again, by contrast the Canadian respondents said their firms had average sales delays of 5.1 weeks. One snippet to keep in mind: Only 37 per cent of GDPR-ready companies experienced a data breach costing more than US$500,000, compared with 64 per cent of the least GDPR-ready companies.